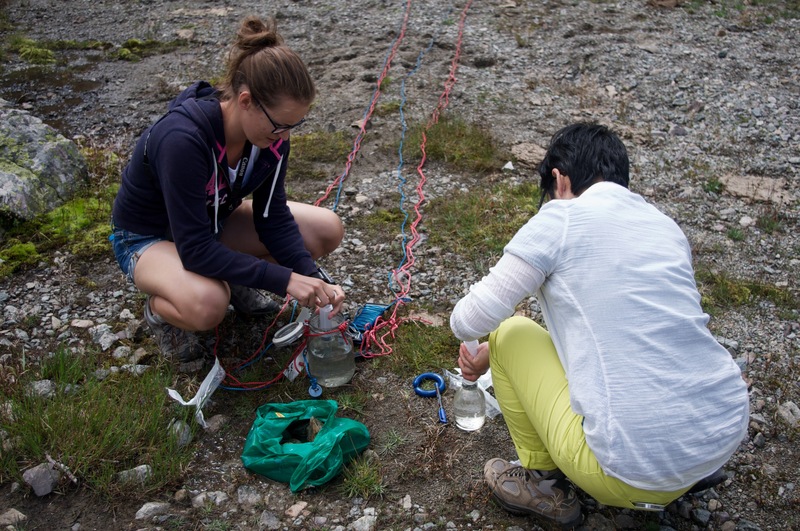 On Wednesday, August the 12th, we have organised a field trip to collect some water samples. We went to Wallis, especially in the Ottans Lake which is close to an former arsenic and gold mine. 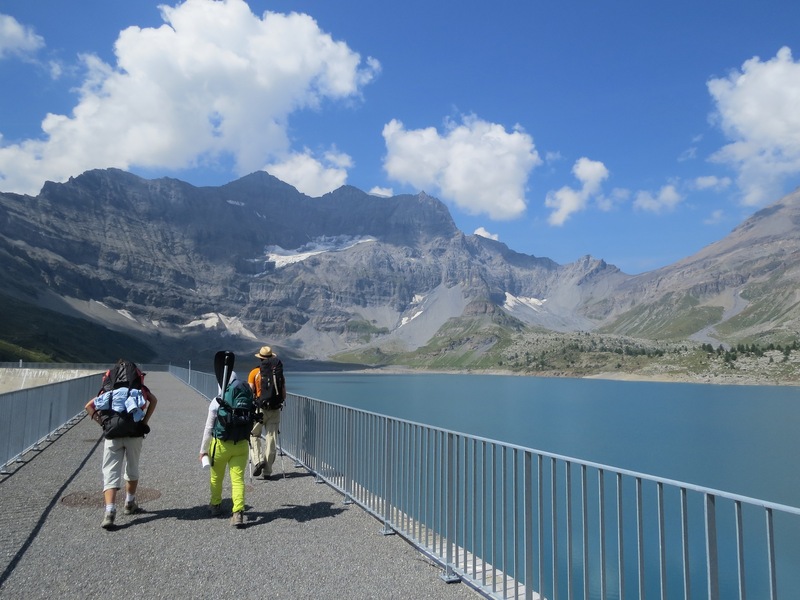 We started the hiking from the Van d’en Haut camping, to go to the Salanfe Lake (retained water from a dam). 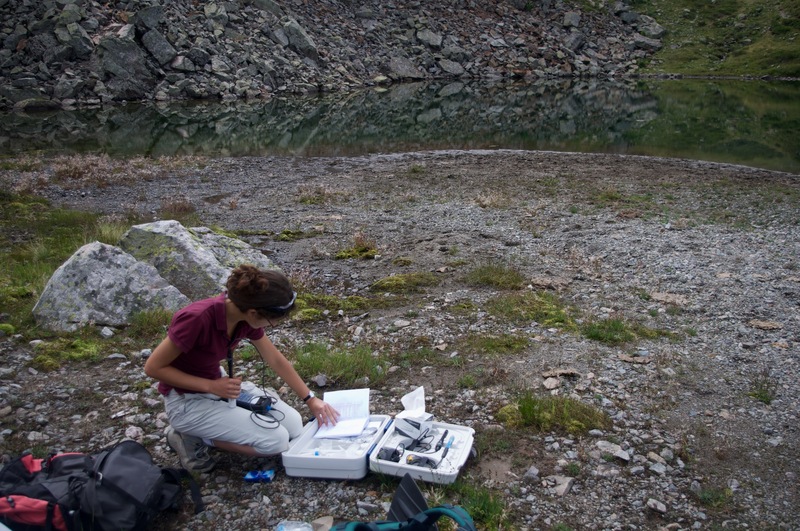 We continued to the Ottans Lake where we picnicked and then performed the water collection and testing. We had chosen to make two different tests. First, we wanted to collect some samples, acidify them to bring them back for testing in laboratory. Secondly, we took vials with bacteria and our prototype 1 to measure directly (after 6h incubation) the fluorescence and the turbidity of our samples. 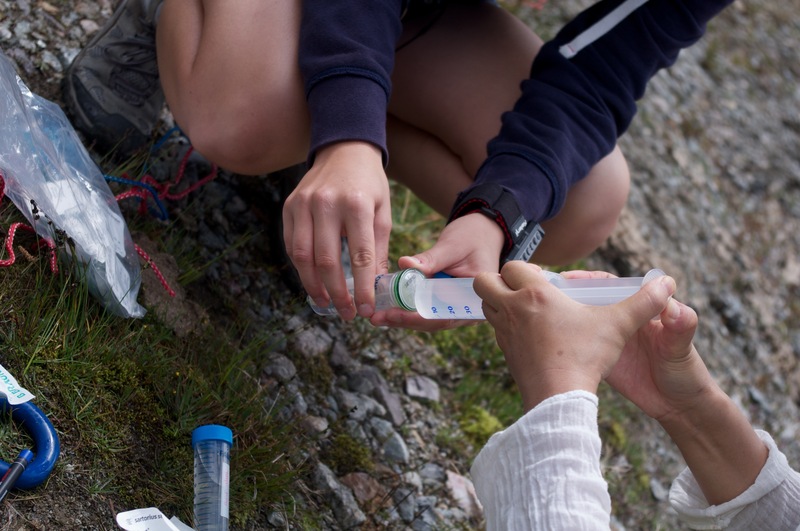 Thanks to Alicia, a environmental master student, who came with us on the filed, we also measured the percentage of oxygen, the pH and the temperature of our samples. 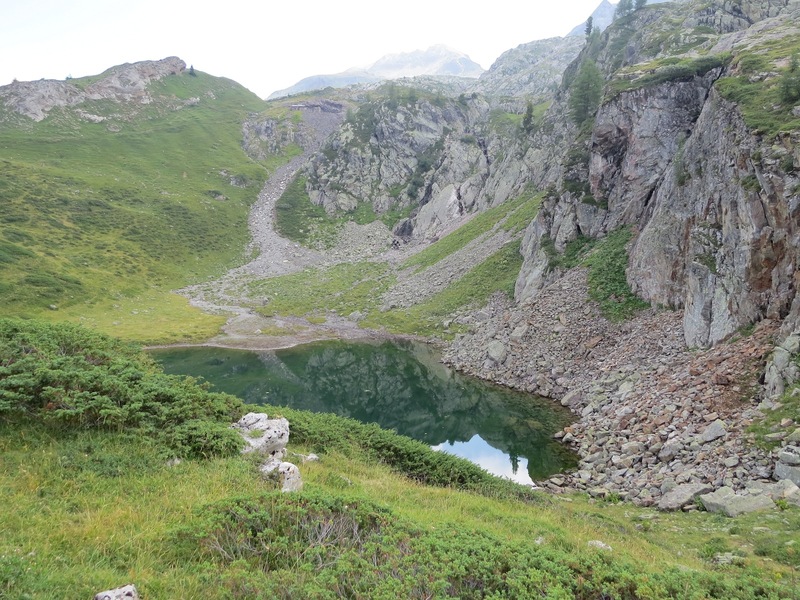 We had choose to make the water collection on the Ottans Lake because it must be contaminated by arsenic from the former mining exploitation. We collect water at 3 points : in deep in the middle of the lake, at the edge and in the waterfall close to the mine enter. Here is a picture of the Ottans Lake. On the top, in the middle, we see the entrance of the old mine. A little further right is the waterfall. We also installed a ephemeral laboratory at the edge of the Lake. 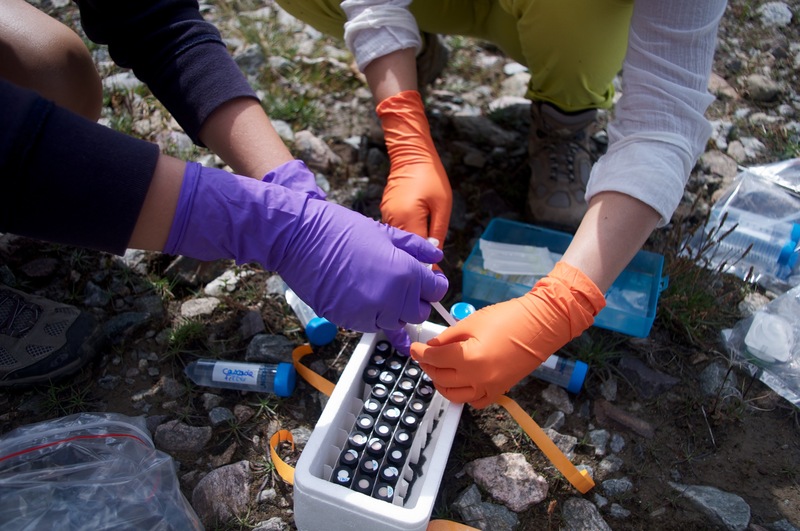 To collect samples into the Lake, we used our special jar. We planned to go in the middle of the lake where it is the deepest, with a small inflatable boat that Sachiko took, but finally Robin swam. We used stones to weigh the jar so that it would reach the bottom of the lake. Once the jar was at the bottom of the lake, we opened the plug for water collection. Then we just had to recover the jar once the air bubbles stopped. We saw further bubbles, when recovering the jar. After we filtered the water, we collected it into vials. The water of this lake is very clear, without smell and colour. The samples from the 3 different sites had been measured by Alicia. Then we acidified some samples, we want to analyse in the laboratory. The other one was introduce into the vials with bioreporter we had prepared previously. After 6h of incubation, they were ready to be measure with the prototype 1. The detailed protocole and the results will be posted in the biodesign wiki page.